Public Domain: Caley Conway performs "Jingle Bells"
“Jingle Bells” isn’t just one of the most popular holiday songs of all time. It’s one of the most popular songs of all time—period. Since New England songwriter James Lord Pierpont published the song—originally under the name “The One Horse Open Sleigh”—in 1857, the wintry standard has taken many forms. Allegedly, Pierpont intended his composition to be a song for Thanksgiving. However, it instantly caught on as a Christmastime classic, as well as a popular late 19th century party song. Eventually, the song’s name was changed to “Jingle Bells,” and both its melody and some of the lyrics in its four verses (yes, the song has four verses!) were slightly changed to their present form. Though the song was written more than 160 years ago, the first recording wasn’t until Will Lyle put the song on Edison cylinder in 1889. Since then, “Jingle Bells” has been performed countless times, including renditions by the likes of Bing Crosby, Glenn Miller, Benny Goodman, Louis Armstrong, The Beatles, Nat King Cole, Perry Como, Duke Ellington, Ella Fitzgerald, Barry Manilow, NSync, Smokey Robinson, Frank Sinatra, Gwen Stefani, and Barbara Streisand, and even The Chipmunks. “Jingle Bells” also had the unique distinction of being the first song broadcast from space when astronauts played it back to earth from Gemini 6 in 1965. 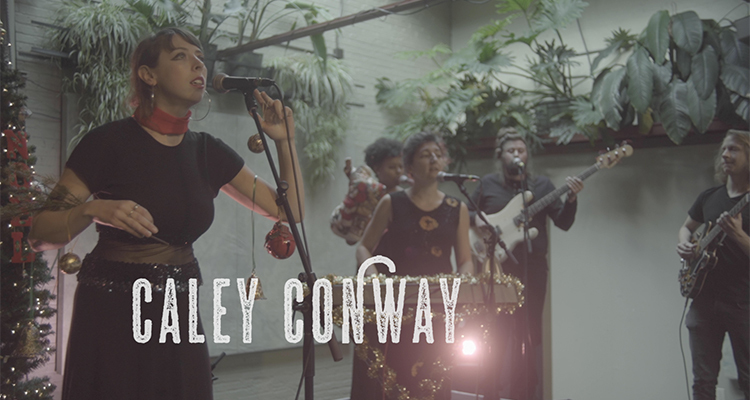 Now, Milwaukee’s own Caley Conway and her band are the latest to take their turn with “Jingle Bells.” The relaxed version of the traditionally lively song is a standout cover from Conway’s 2017 Heart Be Light EP and an outstanding extension of the holiday favorite’s long and rich history. The video was shot, directed, and edited by Cheston Van Huss. Public Domain is sponsored by Colectivo Coffee Roasters, 3 Sheeps Brewing Company, and Transfer Pizzeria Café.